This weeks case has a few things going on in one of the maxillary sinuses. There are three different findings in the left maxillary sinus: an antrolith, sinusitis, and a maxillary sinus septum. 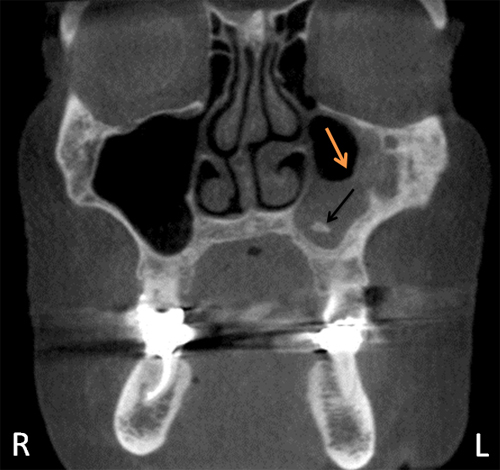 An antrolith is a calcification within the maxillary sinuses. Sinusitis is thickening of the soft tissue of one or multiple sinuses. A maxillary sinus septum is a bony projection from the border of the maxillary sinus into the air space. 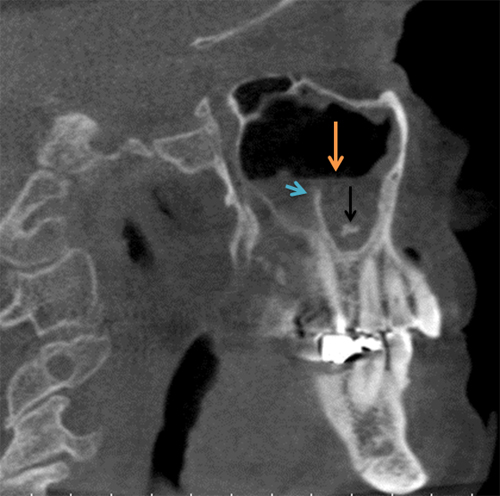 Coronal view showing an increased radiopacity of the left maxillary sinus with the radiopacity of soft tissue consistent with sinusitis (orange arrow) and a well-defined radiopaque entity within the sinusitis consistent with an antrolith (black arrow). If you have any questions on any of these three findings, please let me know. Thanks and enjoy! Firstly sorry for my bad english. I want to ask is it a same think empyema vs sinusitis? Empyema involves the lungs not the sinuses so not the same thing.